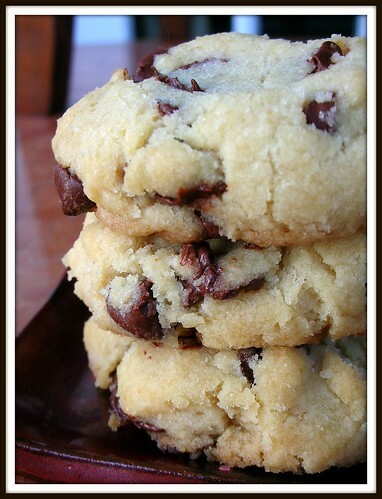 Inspired by fellow blogger Cheriepicked, I made these delicious simple Vegan Chocolate Chip Cookies. The dough was quite crumbly, so you have to kind of pack it into little balls when placing them on the baking sheet. And then I found that cooking them for about 7 minutes first and then flattening them lightly with a spatula, before continuing to bake for another 3 minutes, yielded best results. I was able to make about 28 smaller cookies. In a medium bowl, mix together sugars, margarine and vanilla until creamy. In another larger bowl- combine the flour, baking soda and salt. Add the creamy mix and the chocolate chips to the larger bowl and mix together well. Use a spoon to scoop dough onto an ungreased non-stick cookie sheet. Bake cookies for 7 minutes, flatten lightly with a spatula, and bake for another 3 minutes or until the edges begin to golden. Allow them to cool a few minutes before removing them from the cookie sheet. Their food is always fresh and amazing, albeit their service was getting pretty slow, but I think they've redeemed themselves, as of today. I was with 4 co-workers for lunch, got there at 11:30pm to avoid the major lunch rush, and was out of there by 12:30pm. WONDERFUL. Thank you Boat Street Kitchen, for another well prepared meal and pleasant dining experience. 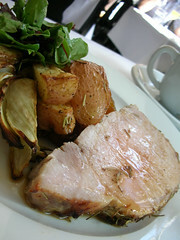 My lunch was Pork Tenderloin with Roasted Fennel and Potatoes. 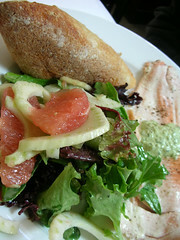 Everyone else had the Ruby Trout with Basil Sauce & Grapefruit Fennel Salad. We went to Vancouver, B.C. this past weekend (my hometown) for a dj gig I had, and the following morning ended up going to Milestone's on Robson St. 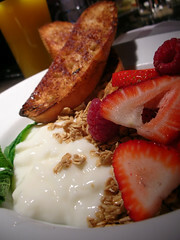 I had such a great breakfast of granola, fresh fruit, yogurt and cinnamon toast! I'm sure most breakfast places would have been super crowded the morning after a Friday night, but they had quite a few tables open. I wasn't expecting much, and thought I would be spending much more moolah than we did. I had the yummiest Caesar drink too! I usually go for Mimosa's but this was equally as refreshing. My friends had a couple variations of an Eggs Benedict, both really tasty, one including Canadian goat cheese! They had a lot of vegetarian options too, delighting my husband who noshed down the breakfast burrito. So check out Milestone's! 1145 Robson St.